You’ve just finished one of our most popular walking tours…here’s where to take a load off and fill your bellies! Have you been hungry in Paris before, and found it overwhelming to avoid tourist trap restaurants? I’m constantly being asking for restaurant recommendations by clients: specifically recommendations on where to head after touring with us. Take ourJewish History of Le Marais tour for instance. This tour is soooo not just for travelers of Jewish faith – it is for everyone. Especially if you’re a fan of falafel, since our lunch break is at an Israeli restaurant famous for it. But walking and sighseeing are hard work and you’ll need to refuel eventually. The ultra-chic Marais district has some of the richest history in the city, and it is a great place to wander around for an afternoon after the tour. There’s so much to see that before you know it, it’s dinner time! 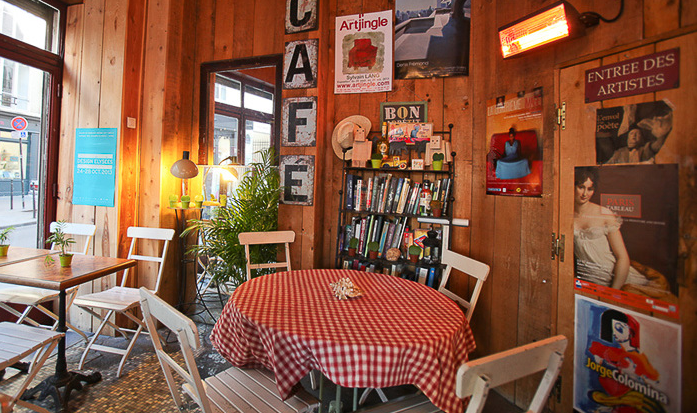 Here are a handful of my favorite Marais restaurant options to help you out. Chez Janou is company founder Karen’s personal favorite, so I had to include it on my list. What are they serving up at this French bistro? Think the classics… We’re talking chevre (goat’s cheese) salad, magret de canard (crispy duck breast), and for dessert…the yummiest chocolate mousse you can imagine (that’s if you’re feeling too lazy to make it yourself – which is deceivingly easy, actually). A bonus for all of you English speakers? The Chez Janou wait staff is known for their excellent English skills and for their lovely attitudes! How’s that for refreshing in a city known for their, um…we’ll say “waiters and waitresses with character”, ha! Open: Monday-Friday, 12pm-3pm, 7pm-12am. Saturday-Sunday, 12pm-12am. What brings me back to Le Voltigeur, time and time again? If you follow our blog, you know that we are constantly on the lookout for the good stuff (again, only when we’re too lazy to make cheesecake ourselves). Le Voltigeur is also quite well known for their hot chocolate, so during the colder months, why not warm up with a steamy cup of creamy chocolatey goodness as well?! Other than the sweet stuff, I highly recommend their quiche! Each portion comes with soup and a salad as well, so you won’t be feeling hungry after. Okay…maybe just hungry enough for the cheesecake. Did I mention how yummy the cheesecake is? How many times in one paragraph can I say cheesecake?! A bonus for this one? The cozy and kitschy decor on the inside, and the classically Parisian vibes of the outdoor terrasse, perfect for people watching, are some more reasons why I really enjoy spending my afternoons at Le Voltigeur. Have you ever had a crêpe in Paris? I’m talking an authentic crêpe in a restaurant, not that 3€ one from a street vendor (I’m not a hater I swear!). When in Paris…treat yourself to the real deal. I mean a crêpe that you can eat as a meal, not just as a quick pick me up after a day of exploring. ALSO, did you know that savory options exist too?! Savory crêpes are called galettes, and are made of buckwheat flour which gives them their golden brown color. At Breizh, they’re serving up combinations such as the Cancalaise (features potato, smoked herring from Brittany and herring roe) or the Charentaise (goats cheese and honey). I highly suggest reserving a table if you plan on eating at Breizh on the weekend. Open: Monday-Friday 11:30am-11pm, Saturday-Sunday 10am-11pm. Simply in my opinion the best fondue and raclette in the city! Raclette is a traditional wintertime dish of boiled potatoes, melted cheese and ham (you melt the cheese yourself with your own personal broiler!). It is incredibly tasty and super traditional in mountainous regions of France. I can’t recommend raclette highly enough. 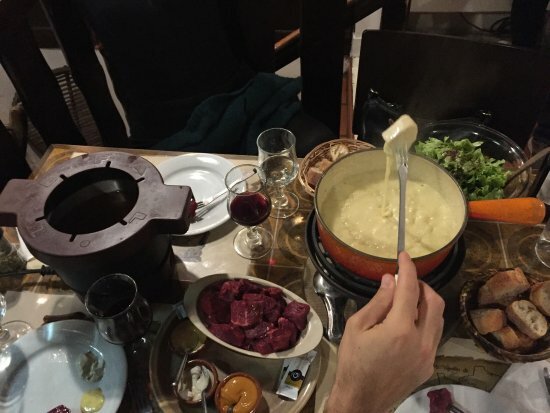 And of course you know what fondue is… this place really does the ‘savoyarde’ just right. Open: Every day from 7 – 11:30pm. 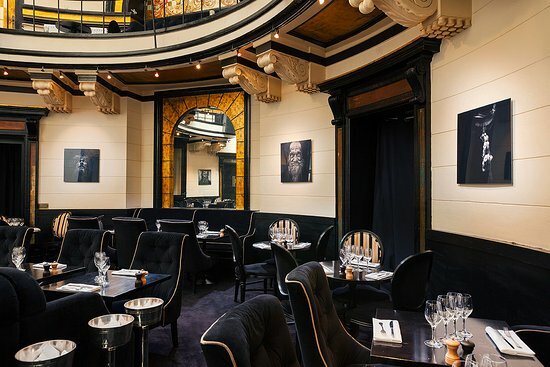 This is an elegant restaurant with – you guessed it – a beautiful dome in the main dining area. The chef uses only seasonal products (I recommend the duck, and the chorizo black risotto if it’s available). On average, starter-main-dessert is 50 euro before wine. One of my favorites in the Marais. This typical French bistro has exceptionally delicious modern bistro cuisine! Located in the heart of the Marais , it offers some of the freshest, most flavorful, and most affordable dishes in the area but remains authentically Parisian. Try the wild mushrooms and escargot, or the entrecote steak (a Parisian classic). Open: Every day noon-3pm, 7-11pm. So, you’ve just finished our awesomely interesting and informative Jewish History of Le Marais tour, and now I’ve given you quite a few choices of where to head next. Comment below if you’ve been to any of my choices, or if you think I’ve forgotten something major! Want more ideas for restaurants in other areas of Paris? Don’t worry, we can help you out! Whether you’re in Montmartre, checking out Notre Dame, or walking along the Seine, we’ve got your back! This entry was posted in Food & drink, Travel Tips and tagged dinner, lunch, marais, restaurants. Bookmark the permalink.